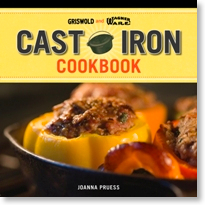 Joanna Pruess, author of the The Griswold and Wagner Cast Iron Cookbook, will appear on Kitchen Ideas on QVC tonight at 9 PM EST. If you haven’t seen Joanna’s book, be certain to read my review. It is perhaps the best cast iron themed cookbook I’ve ever seen. We liked it so much that after we bought ours, we bought three more to give as Christmas gifts last year. Be sure to catch Joanna on QVC tonight and if you don’t already have her book, you may want to order one.